Recently, I put my name on a waitlist at the library to read P.L. Travers’s book Mary Poppins. There was a wait, I supposed, because another reader like myself had wanted to peruse the original book before the sequel to the 1964 iconic film starring Julie Andrews would release next month (with a young Mary Poppins now played by Emily Blunt). 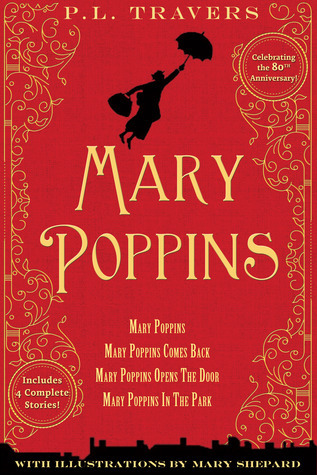 I’d never read Mary Poppins before, though I’d enjoyed the movie growing up as one of the dozen or so VHS that my family owned and watched so many times over that the dialogue and details of it had become so etched in my memory that I can still recall them after having not seen the movie in over a decade or more. Movies have the power to draw us back to the literature that inspired them, as I wrote about in my recent post The Bookshop. But there is something more I’d like to consider about my reading of Mary Poppins, and that is the appeal of children’s literature as a grownup person. I hesitate to say the word “adult” – as though “child” and “adult” were of two different species entirely, instead of being the same one, just further along on the scale of time. “Grownup person” seems to be more fitting in this way (for are we not all just grownup, or semi-grownup, people of the ones we once were in childhood?). As a child who grew up watching the magic of Mary Poppins bring a full-length lamp out of her carpetbag, or jump into a chalk painting on the sidewalk, or scale the chimney tops of London at twilight with the chimney sweeps, the title of this essay was intriguing. But it was also the exact kind of quirkiness that the essayist in me delighted. This reminded me of something that Madeleine L’Engle said, perhaps best known as the author of A Wrinkle in Time, as she recounted in A Circle of Quiet: The Crosswicks Journal what happened when she was asked why she writes for children. “My immediate response to this question,” she writes, “is, ‘I don’t.’ Of course I don’t. I don’t suppose most children’s writers do. . . . I think also of L.M. Montgomery, who is predominantly regarded as a children’s writer, when her books beginning with the famous Anne of Green Gables in 1908, were not originally intended to be read specifically by children. But in the decades since, the book has primarily been marketed for children, young girls in particular. All of these examples of so-called “children’s books” and their creators, who easily come to mind, tells me something about the craft of writing for children. And that is this: that it seems to me that the best children’s writers are not writing for children at all, no more than adult fiction writers are writing for adults. Rather, these writers (whether for children or adults) seem to be writing for themselves, writing down the stories that they feel compel to tell. Their stories, and the relatedness and timelessness they encompass, are adored by children of all ages . . . adult ones included. “Far too many people misunderstand what putting away childish things means,” L’Engle continues, “and think that forgetting what it is like to think and touch and smell and taste and see and hear like a three-year-old or a thirteen-year-old or a twenty-three-year old means being grownup. When I’m with these people I, like the kids, feel that if this is what it means to be a grownup, then I don’t ever want to be one. “Instead of which, if I can retain a child’s awareness and joy, and be fifty-one, then I will really learn what it means to be grownup. I still have a long way to go. And so, as I open up the third of the Mary Poppins books, and again immerse myself in the nursery and greater world of Number Seventeen, Cherry-Tree Lane — with Michael and Jane Banks, and their twin siblings (yes!) Barbara and John, and baby Annabel, and Robertson Ay, and Ellen and Mrs. Brille, and Mr. and Mrs. Banks, and Bert and the Police Man and the Ice Cream Man and the Park Keeper across from their home — I do not read with apologetics that I am reading a children’s book. Rather, I read with a delight of seeing Mary Poppins through Jane and Michael’s wide eyes. Mary Poppins who knows everything. Who everyone seems to know. Who has a nighttime birthday party at the zoo and receives a snake skin as a special present; who has the planets and stars in the solar system dance for her; who helps Noah’s daughter fish wooden tree boughs out of the arc and place them on the tips of trees to bring springtime to the park across the way. Mary Poppins who disappears again when the wind changes, when the necklace breaks, when the door closes. Mary Poppins whose return presence makes everything in the Banks’ household right again. Perhaps that is the lasting pleasure of the literature that is adored by young and grownup children alike: no matter the subject matter of the book, or even its genre, the writer’s words, if the writing is good, invite us to use our imaginations and enter another world for a brief time before we return to our own. Question: What are some of your favourite “children’s literature” books which you have read and enjoyed as an adult? This is a great post, which I thoroughly enjoyed. I tried the “Mary Poppins” books as a child, since I loved the idea of them. I think that they must have been a bit above my reading level at the time (or attention level for the length:), and I struggled. I hadn’t considered going back to try them now, but may do just that! I certainly want to see the new movie. There is a wonderful book that my sister gave me called “Wild Things: The Joy of Reading Children’s Literature as an Adult” by Bruce Handy, which discusses some of the same points that you have brought out in your post. You might enjoy it, too! Thanks Becky! I’m so glad you enjoyed the post! 🙂 I would highly recommend *Mary Poppins,* if you feel at all inclined. Not only was there was a lot in the book that wasn’t in the movie, I found reading it as a grownup to be enjoyable for the writing itself. I love that idea that returning to a book you read as a child was like “going home” – that’s a beautiful image, especially as you have the memory of finishing the book when a child and falling in love with mysteries. It reminds me of sitting in my bedroom when finishing a novel as a young teen and feeling delight over what I had just read (it was one of the Anne of Green Gables books), mixed with sadness that it was now over. Thanks so much for the book recommendation! I picked it up from my local library yesterday, and I’m finding it fascinating! I’m on the first chapter about *Goodnight Moon* and how that can be such a different reading experience as an adult, especially with the context and insights that Handy provides. I love what he says in the intro, which sounds exactly what you were referring to in your comment: “It should go without saying that the best children’s literature is every bit as rich and rewarding in its concerns, as honest and stylish in execution, as the best adult literature — and also as complicated , stubborn, conflicted, and mysterious.” Beautiful! Thanks again for your comment and great suggestion! You’re so welcome, Heather! I’m happy to hear that you’re enjoying the book by Bruce Handy. As a child , teen, and adult, I have enjoyed so many different “juvenile” works: A Wrinkle in Time, The Phantom Tollbooth, The Chronicles of Narnia, Harry Potter, The Golden Compass, The Island of the Blue Dolphins. I can still enjoy any of these (and more) today. I really don’t see the line. Even Curious George and Ralph and His Purple Crayon (not to mention Dr. Seuss), come to mind. I love that you don’t see a “line” between the so-called children’s literature and adult literature. It makes me wonder who it is that “decides” what is for children and what is for adults. Is it the author, publisher, marketer, bookseller? Ironically, it seems that usually it’s NOT the reader! Thanks for sharing some of your favorites! I hadn’t considered picture books to fall within books I could read and apreciate as an adult, but I think I’m going to go revisit some of them. Thanks for your comment! I should also have noted that I read a lot of “adult” books as a tween and teen. I enjoyed so many books as a child that all the titles have become a blur as they pass through my memories. The Hans Christian Anderson fairy tales and Charles Lambs’ Tales from Shakespeare were classics, as well as Teenage Historical Stories, but Gone With the Wind stands at the top. It was the summer I turned 12 when I read it for the first time and became so immersed in its aura and pathos that it ambience influenced much of my later reading choices. College literature courses focusing on Southern writers reinforced my attitude. Only when I returned to college decades later was I introduced to, and “forced” to read, more current writers. My, how my mind broadened. Then along came those whole series of The American Girl books I read to my grandchildren. It was back to historical fiction all over again! I know what you mean about the titles becoming a blur! – I wish I’d kept better track of the books I’d read in childhood and as a teen and young adult! Thanks for pulling so many from memory! It’s interesting in the discussion of enjoying children’s books as adults, there’s also the flip side of enjoying what’s considered “grownup books” as children or youth, as your example of reading of *Gone with the Wind* at the age of twelve evokes. I love that you’re able to see the clear influence it had on your reading tastes, not only in your youth but as a grownup as well. It’s giving me cause me to consider what “grownup books” I might have read as a youth as well, and what influence those might have had. Thanks so much for commenting and sharing your experience! My favorite book to date is Alice’s Adventures in Wonderland, and I consider Lewis Carroll, J.M. Barrie, and A.A. Milne a Holy Trinity of sorts. Some of the greatest philosophic ideas are best distilled with the kind of simplicity achieved in a children’s book. I very much appreciate your perspective on this, thank you.